Eating out while celiac can be a bit of a gamble. You are putting your trust in a lot of people, that the wait staff will understand your request for gluten free options and will accutrately bring that request to the kitchen, you then hope that the kitchen staff and the chef are honest about what you can and can’t eat and how gluten free the prep area for your meal will be kept. I would much rather be given a hard no when I ask for a gluten free option than a lazy or uniformed yes that will leave me suffering. As such every really great restaurant experience I have, those times when I know I can relax and trust that the food I am given can be enjoyed without worry, become treasured memories. 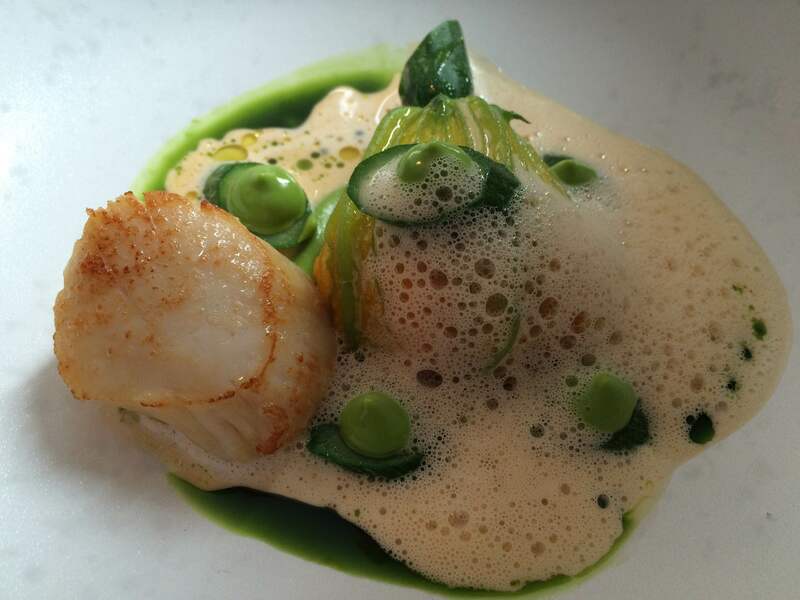 I had been given a gift voucher by the lovely people I work with for the Michelin Starred The Greenhouse on Dublins Dawson St and I had been hoarding it for almost a year waiting for a special occassion. Having decided that my birthday would do as an excuse to splash out I had a look at the menu and then emailed the restaurant to see if they could cater for a celiac diet. I prefer to email rather than call as this will give the host time to do some research before responding. I was assured the dietary restricion would not be an issue so I made a booking for lunch. The lunch menu is a very reasonable €38 for three courses or €29 for two. There were only two options offered for each course with desert including a cheesboard as a third option. Some people might find this limiting however I knew that this meant that the kitchen was extremely clear about what ingredients would be going in to each dish and therefore they would be better equipped to point out any potential for gluten to sneak in to the dish. As it turned out there was ony one item on the menu that could not be adapted to be gluten free and that was a custard tart. While we sat and started on our first glass of wine we were presented with two tiny tasty morsels, for me there was a savoury beetroot macaroon, light as air but earthy with the deeply savoury flavour of the beetroot meringue lifted by a slightly sweet filling, it was delicious and I will have my macaroon making sister hard at work replicating this as soon as possible. Our waiter then brought out some delicious looking homemade bread for my companion and as I sat there resigned to my usual routine of watching someone enjoy good bread while I sip pensively at my water a second serving of bread appeared for me. 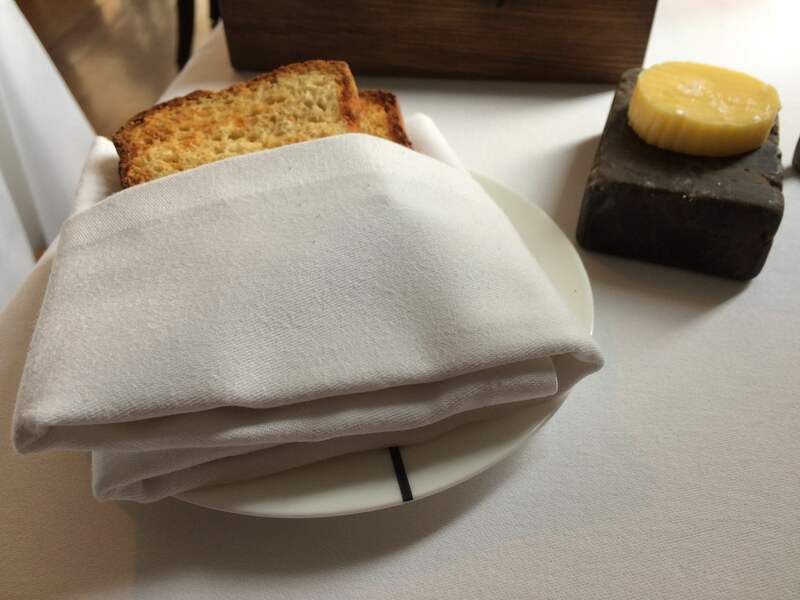 Nestled in a bed made of napkins to keep warm the house made gluten free bread was toasted to perfection and had a lovely sourdough flavour. I was asked to wait one moment while an individual serving of butter was brought out for me so I didn’t have to risk sharing the butter that was already on the table. This kind of attention is very reassuring when you are worried about cross contamination. My starter was a courgette flower stuffed with the lightest possible chicken liver mousse, served with one perfectly cooked scallop and a spiced shellfish sauce. Dotted around the plate were daubs of a deep green puree that was clean and fresh and worked incredibly well with the richness of the mousse. The courgette flower seemed to have been poached or steamed rather than fried and so the texture was tender and light. The starter was served with a spoon as well as a fork and I used that spoon to get at everylast drop of the shellfish sauce. 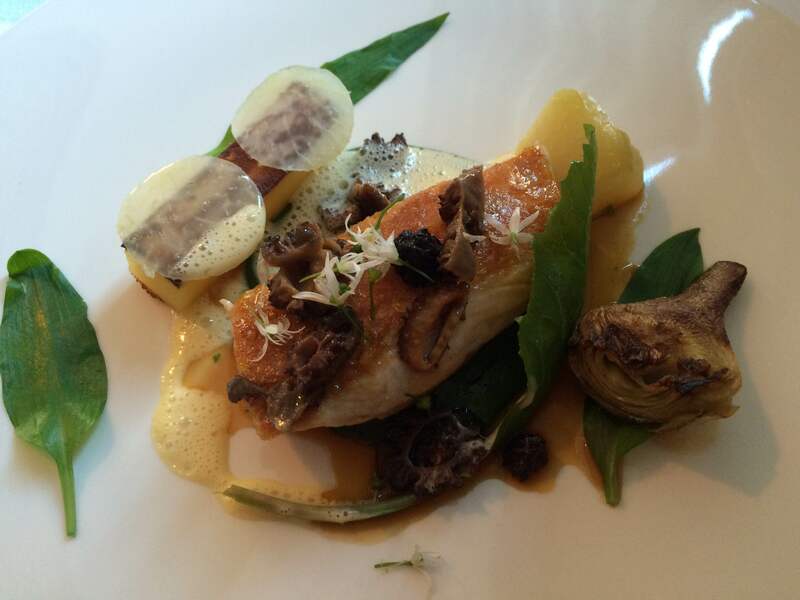 For main course I had the Guinea fowl served with Wild Garlic, Turnip, Kohlrabi and Bacon Cream as did my companion. Again this was a dish that made me want to clap my hands together in glee, beautifuly plated but not so twee and overly decorated that it looks more like art than food. The Guinea fowl was so perfectly cooked that the knife cut through it as if it was a slab of warm butter. The garlic leaves packed a good punch and the Kohlrabbi and Turnip, very similar vegetables were presented so differently that they complimented each other rather than being just a repition of the same flavour. There was a slim raft of layered potatoes, just enough to soak up the Bacon Cream sauce. This was a dish to savour and I found myself taking tiny bites to make the experience last as long as possible. Desert was the Passion Fruit Souffle served with a jug of white chocolate and ginger sauce. 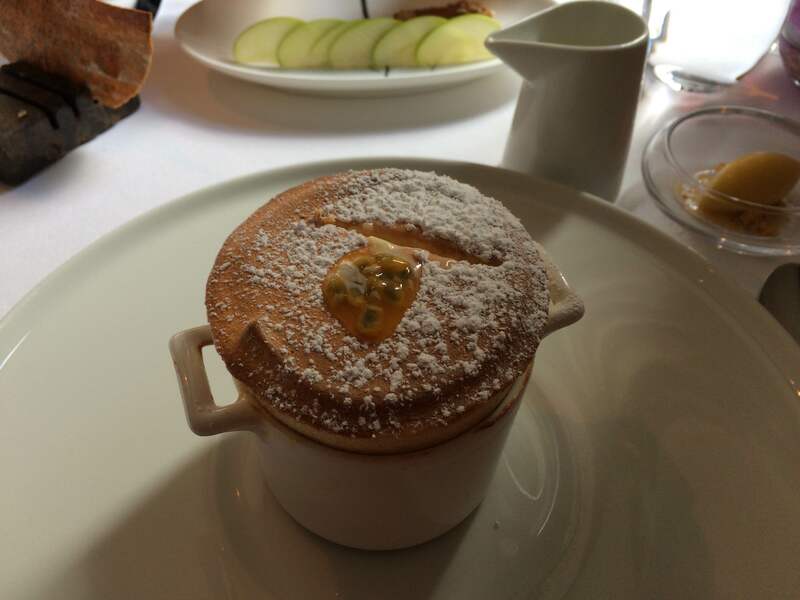 rising from a ramikin in a delightfully tall tower the souffle is airy as a whipped mousse with the sharpness of the passion fruit complemented by the rich creaminess of the chocolate sauce. I also managed to beg a few slivers of cheese from my companions cheese board and they were all delicious. Everything about this meal was delightful, the staff are warm, accomodating and knowledgable about the food they are serving. Each course was accompanied by a detailed description and a smile that assures you that you are going to enjoy each morsel on your plate. For fine dining the restaurant is not at all stuffy, you would feel comfortable walking in for lunch in jeans and a nice top, no need to break out a dress and fancy heels. The emphasis is on creating a welcoming space for you to enjoy Chef Mikael Viljanen’s seriously good food, the kind of food that makes you chuckle with pleasure over each bite and sigh with contentment when you are done. That I was able to enjoy this meal and not worry about gluten being an issue made this a birthday lunch to remember.